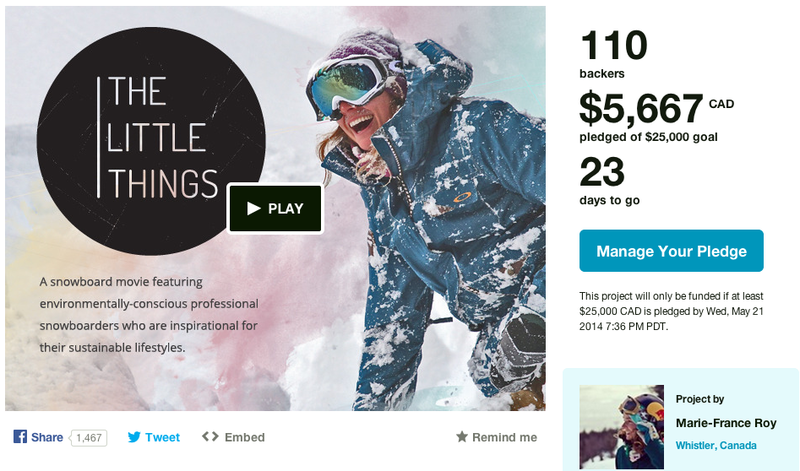 Snowboard Green: The Little Things on Kickstarter! It's a snowboard film featuring the stories of riders who are inspiring for their environmentally sustainable initiatives and lifestyles. The Little Things on Kickstarter! It's a snowboard film featuring the stories of riders who are inspiring for their environmentally sustainable initiatives and lifestyles. If you are reading this, chances are you love snowboarding as much as The Little Thing’s crew does. But unfortunately, between pow turns, high-fives, and chairlift rides, talking about the carbon footprint that is getting left behind has become as taboo as calling out “last run.” Let’s be honest here; stopping to think about what one can do to make a difference for the future of our environment doesn’t seem high on the priority list when you are focussing in on dropping one of the biggest cliffs of your life. Like David Suzuki says in The Little Thing’s third teaser, “We are dependent on nature.” As a bunch of snowboarders who feed off something as simple as just one foot of snow, we couldn’t agree more with Mr. Suzuki. Now don’t get the wrong idea: The Little Things movie is not here to kibosh your life-long dreams of riding pow every single day – it’s simply just a vessel to showcase a collective group of snowboarders – Jeremy Jones, Gretchen Bleiler, Tamo Campos, Meghann O'Brien, Marie-France Roy, Jonaven Moore, Mike Basich and more – that have chosento be outspoken and make positive changes towards a sustainable environment while keeping snowboarding high on their priorities list. The Little Things is an initiative taken on by professional snowboarder Marie- France Roy and directed by Filmmaker Darcy Turenne. A Kickstarter campaign has been spearheaded to help wrap up the this two-year project, as getting into the final details, like securing music rights and finalizing footage, gets costly. The Little Things is a non-profit movie and all funds raised will go towards Protect our Winters and The David Suzuki Foundation. I read your post and it is too good post having inspirational and interesting contents.